Review of Celestia (out now) and and an upcoming Kickstarter preview for Go Nuts for Donuts. Welcome to another edition of Meeple-Size Reviews. This time we are talking/revewing Steampunk (Celesita) and Donuts (Go Nuts for Donuts). 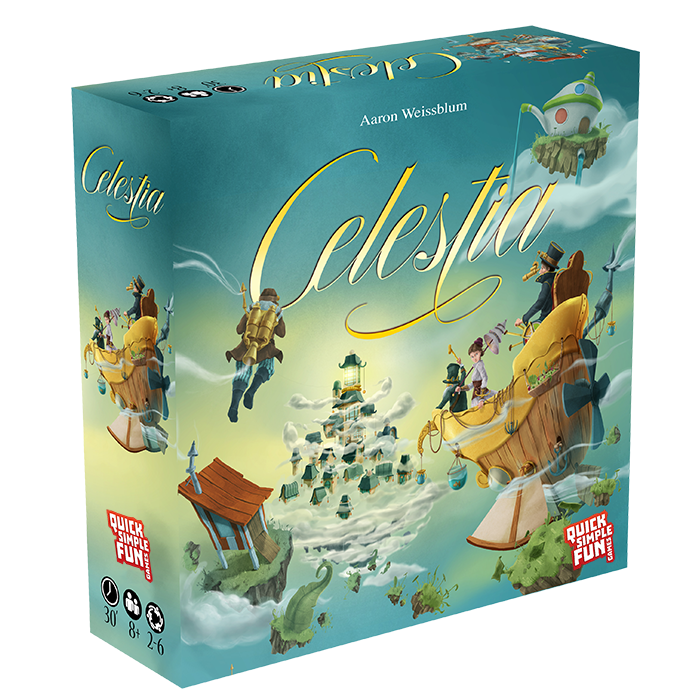 Celestia is a re-themed and re-imagined version of Cloud 9, a push your luck game. The beginner variant plays like a Steampunk re-theme of Cloud 9, with the normal game adding a few new extra twists to the game. In both versions of Celestia, players collect treasure cards and take turns being the Captain of the airship. On each turn, the Captain will roll a certain number of dice (depending on where the airship is currently located) which depict dangers the airship is about to face. The other players have to decide if they think the Captain has the cards in their hands to defeat all the challenges. If the players do not think that the Captain has the necessary cards, they jump off of the airship and take a treasure card located next to the ship (and are out for the rest of the round). If they think the Captain does have the cards, they stay in the air ship and get at a chance for a greater treasure reward. Then the Captain either plays the cards to defeat the dangers and the airship moves up one space or the captain says he cannot defeat the dangers and the airship crashes and you start all over at the first city. Depending on which variant of the game you are playing, their are a few other cards that you add into the deck to add some twists, like a jetpack that allows you to bail as the ship is crashing and still collect treasure or a card that allows the captain to re-roll any number of dice the Captain has, and a take that card that makes the Captain have to roll any non-danger dice faces again (they are blank sides in the game). Also, depending on the game variant that you are playing will depend on how you win and end the game – either the first to 7 unique treasures or 50 points ends and wins the game. Having played both version with the family – I think they are split on which version they like the best. However, almost all involved (except the youngest to play) thought the games went on just a little too long no matter which version they played. I will say we played all our games as 5-player, so I don’t know if that had a role in it or not. 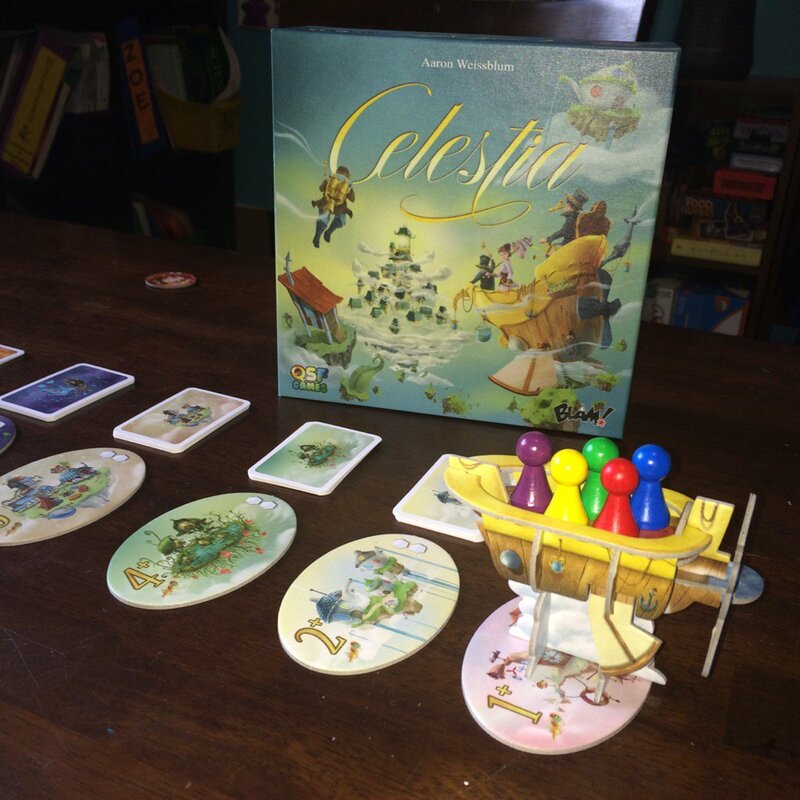 Celestia is pretty decent push your luck game that can be played with higher player count and still be enjoyable. However, while the game can be a pleasant experience at times, it can feel like it is dragging on at other times. From comments I have seen online, this game can be polarizing, you love it or it falls flat. I would recommend trying it out if you have a chance, but at the same time I would also recommend trying it before you buy it. It is one I can possible see coming out every once in a while to play with the family, but not one that is coming out every week (or even every month) family game night. Celestia is available for purchase now. In Go Nuts for Donuts, a certain number of donuts come out in a “display case” (depending on the number of players in the game). Players then use numbered cards in their hands to decide which donut they want to claim, placing their numbered choice face-down in front of them. Simultaneously players reveal their donut choices. Two things can happen as you reveal your cards. Going in numerical order you see 1) If two or more players picked the same donut no one gets the donut and the card is discarded or 2) If you were the only one to pick the donut, you win the donut. However, if the donut card has a special power you must perform the power now, whether you want to or not. Their are 20 different donut type cards in our preview copy, each with their own scoring capability. These 20 different types can be broken up into 3 main categories. Some donuts give you a special power that players must use right away but either give the player no victory points or are worth minus victory points at the end of the game. The second category give you straight up points as indicated on the card and the third category of donuts are ones that give you points if you fulfill certain requirements at the end of the game. 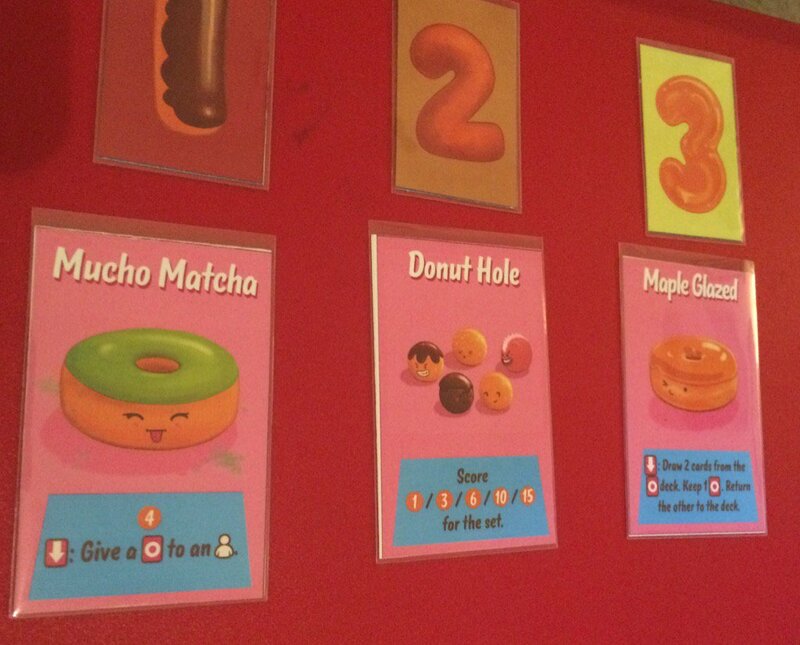 On top of this, there are a different number of each kind of donut in the game depending on the type of donut. For example there are only 2 bear claws in the game, but there are 6 Boston Cream cards. This may seem complicated, but it is not at all – in fact I think this game would be easier to teach to “non-gamers” then say the aforementioned Sushi Go!, because picking and playing a single number card is a lot easier to teach to someone than to teach someone how card drafting works in a card or board game. It may not be my first filler choice that I would play with table of gamers, it is one that would be not only great to play with kids and adult mix company, but also perfect with other adult non-gamer family members. Is the game perfect – do I see any cons? One con is that some of the card types fall flat in lower player counts – with 4 or more players being the sweet spot. However, my understanding is they will be working on tightening this up. Right now I would only recommend the game for a 4 or more player game. I will note that while this might not be a con for many, there is a little take that in the game (not too much – we didn’t have an issue with it) like making someone discard a card in their personal display or give you a card they earn. So if you are sensitive to that please note that. I also feel like there should be some more direct scoring opportunities in the game. What about the positives? Well as a whole it is a very nice quick filler that can play up to 6 people. Kids as young as at least 8-years-old can enjoy playing and understanding the game. It has a charming game with its theme and cute Kawaii style art. The game doesn’t over stay its welcome with even 5-players – in fact I wouldn’t mind it lasting a round or two longer, seeing specifically some more straight up scoring card types. Go Nuts for Donuts is easy to teach, it makes a great little family game for family game night and you may find the kiddos (as well as the adults) craving more of this sweet game, wanting to play again and again. Give this one a good look at when it hits Kickstarter. 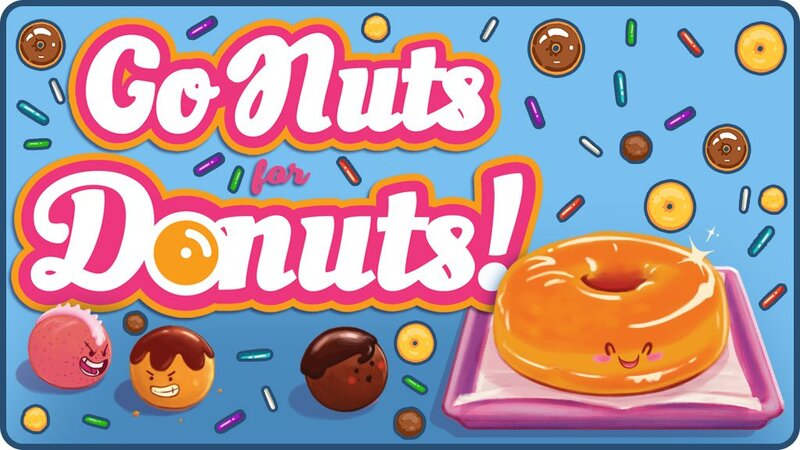 Go Nuts for Donuts will be on Kickstarter September 20, 2016. The Inquisitive Meeple Note: A review copy of both games was given to The Inquisitive Meeple. Any positive opinions/feedback on the game are our own. They were not solicited by publisher or by the designers.